It's all about the gin baby! 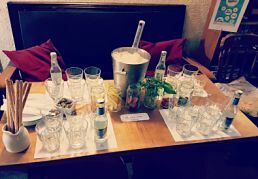 Our fun & entertaining staff will come and set up at your accommodation, before taking you on a fantastic gin and tonic making experience and show you how to make the perfect drinks. You’ll learn about the essence of different and unique gins, garnishes and mixers, and you get to compete against your fellow participants to ‘create your own masterpiece’ and win a prize! Loads of different gins to try, and so many mad recipes! What's not to love? !